1 How to find out if your haritaki is pure? How to find out if your haritaki is pure? I recommend organic haritaki as the most pure form of haritaki. Haritaki is the fruit of a tree and if the tree is not certified organic then it could have been in an area of India where industrial pollution was present. If you have been to India you will have seen areas where trees are for sure absorbing pollutants. Lead. Check to see if there is any Lead in your haritaki. Some Ayurvedic herbs have increased amounts of lead in the herbs. However haritaki does not naturally absorb lead into the fruit, so we would not expect it to be present at all. Check with the supplier to ensure that the haritaki is tested for lead content. Fungus. Check with the supplier that the haritaki has been tested for fungus. Haritaki, as a fruit comes off the tree and can sit on the ground in wet conditions. This can cause fungal growth. also improper storage of the fruit can cause fungal growth. Other heavy metals. These include arsenic. Again check with the supplier to ensure it is tested for heavy metals. Added Dirt. I regularly get questions about if there is dirt added to the haritaki. I have no idea on what basis these questions arise. I have never seen dirt in any haritaki products that I have come across. There are occasional darker particles in the haritaki, however these are naturally occuring in the fruit. Haritaki seeds. In Ayurveda there is information for using the seed and not using the seed in making the powder. While this does not affect purity, the experts in the field of Ayurveda that I trust recommend using haritaki pulp, made into powder, rather than including the seed in the powdering process. 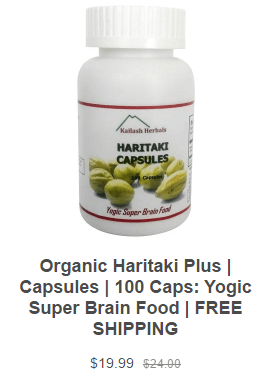 In the above article the authors tested 3 different sources of the Ayurvedic compound Triphala, and found that in some samples there was a high level of lead in one sample. In this article the changes in climate and growing conditions are featured as an effect on the wonderfulness of the ayurvedic herbs to function effectively, including haritaki purity tests. The quality of plants and herbs in natural environment 5,000 years ago, is not the same today due to altered method of collection, commercial growing, residue of chemical fertilizers and pesticides in soil and water (taken up by the plants in the wild too), climatic changes and manufacturing technology. Hence unwarranted use of substandard or unregulated use of standard medicines increase the possibility of side effects”, said Bhalerao. Not all medicines sold in the market claiming to be ayurvedic drugs are purely from that discipline, said sector specialists.